(1) Industry recognized in biohazard clean-up; AMDECON, Inc. Training Center Endorsement. Ozone Generators are known by the professional fire, flood restoration industry, crime scene / death scene clean up industry as highly effective tools to safely, permanently remove fire, mold, smoke damage, biological odors, dead animal odors and more. o3ozone.com with the ozone generator products/ information we offer have recently received endorsement from AMDECON INC. a respected crime scene / death scene clean up / bio-recovery training center. The following is information about the training course, and products used. AMDECON INC is the leader in Crime and Trauma Scene Decontamination Services including Meth Lab cleanup (crime scene cleanup and bio-recovery) in the Dallas/Fort Worth, Texas, area and is recognized by over 100 law enforcement agencies as the experts in the field of Crime and Trauma Scene Decontamination Services. AMDECON INC. offers comprehensive training courses for the Crime and Trauma Scene Decontamination Services with the AMDECON Training Center. The training course has chosen the Ozone Generators we offer for biohazard clean-up and odor removal. 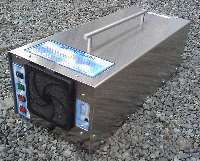 Why are UV ozone generators a better choice than corona discharge ozone generators? The Biggest difference between corona discharge and UV ozone generation methods is that UV ozone generators have stable ozone output levels throughout humidity ranges, while the output of corona discharge ozone generators is significantly reduced by just moderate humidity levels such as 40–70% (ozone output is reduced by approx. 40-70% with 40-70% humidity). In addition, with UV ozone generators, the cleaning requirement is almost eliminated compared to corona discharge ozone generators. Also, the ozone produced from a UV ozone generator is cleaner (no nitric acids) and smells better than ozone produced from corona discharge machines, and is just as powerful and often more powerful as ozone produced by corona discharge ozone generators. If you need an ozone generator with adjustable ozone output, two new models, the UV PRO 550AT or UV PRO 1100AT are ideal. The "AT" stands for Adjustable with 48 hour Timer. These models produce the cleanest and sweetest ozone ever possible - adjustable down to very low levels or high levels for shock treatments and are much more dependable than corona models on the market! Please call 330-497-6900 for information or to purchase. This is the new choice for Commercial Ozone Applications / users! High powered UV PRO 6800, UV PRO 4000, and UV PRO 2800 Ozone Generators. Use for serious restoration work, commercial applications, manufacturing, barns, etc. Read why UV ozone generators outperform units rated higher. The UV PRO 2800 is designed for use as a heavy duty Ozone shock treatment tool. In higher humidity, the UV PRO 2800 exceeds the ozone output of the PRO 5,000. (Read the product description to understand why). Ideal for use in fire / flood restoration, crime scene cleanup (protein decomposition), garbage compactors, garbage transfer stations, heavy restoration, auto detailing, all heavy odor remediation tasks, food service sterilization packaging / manufacturing, bacteria or mold odors Home/ Commercial decontamination, purifying rooms in hotels and for killing mold, and more. The UV PRO 4000 is designed for use as a heavy duty shock treatment tool. In higher humidity, the UV PRO 4000 exceeds the ozone output of the PRO 10,000. (Read the product description to understand why). This is the new ultimate choice for Commercial Ozone Applications / users! The UV PRO 6800 is designed for use as the ultimate heavy duty shock treatment tool. In moderate to higher humidity, the UV PRO 6800 exceeds the ozone output of competing units rated at 29,000mghr. (Read the product description to understand why). Michael J. Tillman, Founder and President of AMDECON INC. is an OSHA-authorized trainer and is certified in Hazardous Materials, Weapons of Mass Destruction, HAZMAT & Safety at Clandestine Drug Labs, Drug Lab Decontamination Procedures in the states of Oregon and Washington, Bloodborne Pathogens and Trauma Scene Management. He has personally supervised 500+ CTS Decon projects. The 5-day Crime and Trauma Scene Decontamination Specialist training course is for those who want to start their own crime scene cleanup business or go to work for an existing company. For more information, see the course details here. This course is highly recommended for those who aspire to be successful in the field of CTS Decon! We feel this endorsement is a testament to the accuracy of o3ozone's informational website and the performance of the ozone generators we offer. "Ozone is considered to be the leading technology of the 21st century for improving the environment. In partnership with the world's best ozone authorities and users of ozone treatment technology, you may witness and even participate in the further development of this exciting new field. Drinking water treatment; industrial and municipal wastewater treatments; odor control; air purification; agricultural , food processing, aquaculture, and marine uses are among those areas where ozone treatment has been shown to have exceptionally beneficial effects. Ozonation is the newest frontier in the effort to improve the human environment. Whether you have a casual interest or you are one of the growing number of users of ozone technology or a researcher in the ozone field, the IOA is the only international organization that can help you to find the important information and support that you may need. Let the IOA place you into the mainstream of the rapidly developing ozone technology." The Food and Drug Administration has recently amended its food additive regulations to permit ozone use as an anti microbial agent. The amendment, published in the Federal Register on June, 28 2001 allows for ozone use in gaseous and aqueous uses, and for safe and effective anti microbial treatment of meat, poultry, and other food products. (4) CNN.com /WORLD NEWS report - "Firm sees ozone as food disinfectant"
"With chlorine you have ongoing costs, and there are some quite significant environmental and safety costs which don't exist with ozone. In Europe and the UK, chlorine has been banned as a disinfectant for organic food -- a rapidly growing sector of the food industry. And last July the U.S. Food and Drug Administration approved ozone to disinfect food." After reading the CNN article (link above), you can understand when we say that ozone is safer than bleach!